A slightly shorter option to the 5 passes trip but of similar if not more difficulty. Can be done in 3 days but I would recommend longer to allow for possible bad weather or just to make it a bit more relaxing. Sugarloaf Pass • By aardvark. Licence: C.
This trip begins at the same place as the Routeburn Track, from the shelter at the end of the Routeburn Rd. Cross the swing bridge and follow the track until you are about 100m upstream from the shelter building on the opposite side of the river. to Lake Nerine • By bernieq. Licence: cc by-nc-sa. Look for the turn off to Sugarloaf Pass. 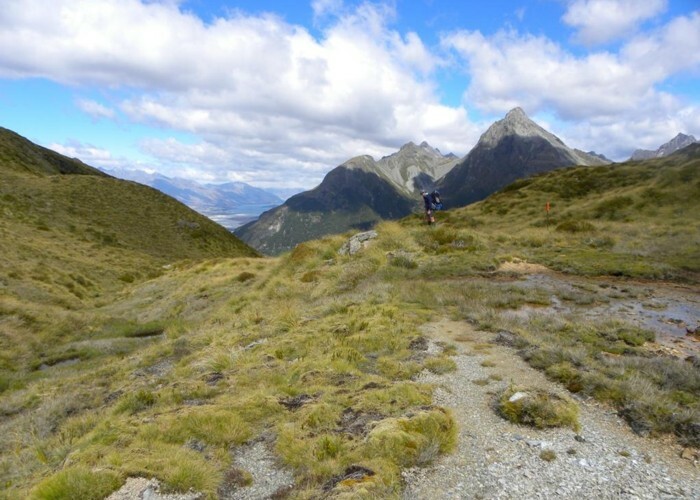 This is deliberately not marked so as not to confuse the masses doing the Routeburn track. Once you have found the Sugarloaf track it is well marked. The track climbs steely to the Sugarloaf Pass. The pass is generally boggy but there are spots dry enough to pitch a tent. A good option is to catch the last bus of the day up the Routeburn Rd and then do an evening climb to the Sugarloaf. From the Sugarloaf pass the track sidles on the Rockburn side for a while and then steeply descends. At a point still well above the river a DOC signpost marks the intersection with the track comming up the river from the gorge. Make sure you head in the up valley direction which sidles from here and not the down valley direction which continues to desend to the river. The track soon comes out on the river bank after passing a large rock bivy in the bush. From here the track continues up the river bank to a swing bridge just below Theatre Flats. Cross the bridge and within a couple of minutes you are on the flats. Many guide books mention a large rock in the centre of the flats as a good place to camp. However I have seen this rock surrounded by several inches of water, but there are no doubt good camping sites all over Theatre Flat. From the flat you will see a knoll on the true left of the river immediately upstream from the flats. The track crosses the saddle between this knoll and the side of the valley. It is easily found at the bush edge. On a good day it is well worth dropping packs on the saddle and climbing the knoll which is covered in stunted rock gardens and you can get good views both up and down the valley. Descend from the saddle to the upper Rockburn Flats and continue up valley on the true left until you get to the head of the valley. Make your way from here to Park Pass, passing a rock bivy on the way out which may be OK except it might be a little exposed to the south. Theatre Flat • By pmcke. The top of Park Pass is marked by a large tarn and despite being rather boggy, sites can be found to pitch a tent, if a tad exposed. From here the route to Lake Nerine is not defined and requires good route finding skills. As it is often foggy, it would be a good idea to study the map beforehand and make yourself quite familiar with the route. Follow along the ridge south from the pass until the ridge becomes steeper. A cairn marks the point where you drop on the eastern side of the ridge into a tussock basin. From this basin make your way towards the steep tussock slopes. These slopes would be very dangerous if covered in snow but I think the scree has consolidated a little since I first crossed this slope in 1971. 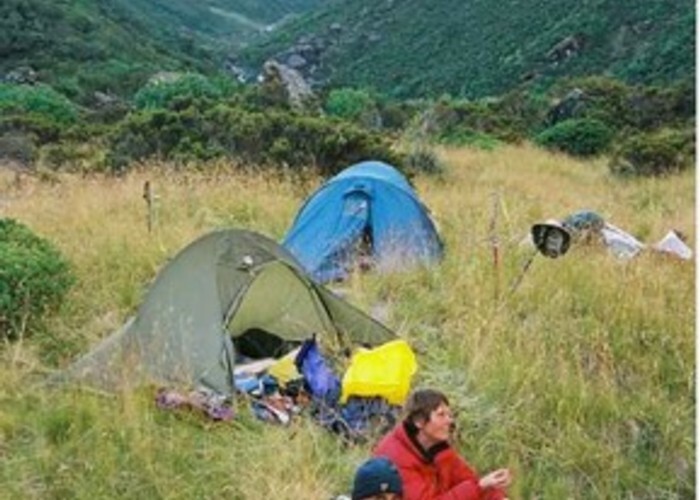 I think the main danger to a tramping party in good conditions would be if someone put down their pack and it rolled away. I suggest that you move slowly and steadily on this section and keep you pack on your back. Traverse and climb steadily and you should come out on easier ground at the 1500m contour where you will encounter the most interesting and scenic mountain tarn. You can go round the tarn on either side, though I suggest going to the left as you will then get the most impressive views down the Rockburn River. There is a gully and notch in the ridge immediately south of the tarn which leads to Lake Nerine. This is obvious on the map but not as obvious on the ground. Once at the notch you will see Lake Nerine and another tarn below. The slope to Lake Nerine is often snow covered and provides an easy glissade to the lake. However if not snow covered it is steep slabs which can be more awkward. We found it easier keeping left and descending in the gully from the notch. Lake Nerine is a magical place and is well worth camping a night or two here to really enjoy it. From Lake Nerine, head for the southern most of two dips in the ridge to the west of the lake. Pass through this dip and traverse to North Col, maintaining height as you go. North Col is at almost exactly the same height as the dip so if you do descend then you will have to climb to the col. The going is easy but there is a terrace below you that some people prefer to go down to. 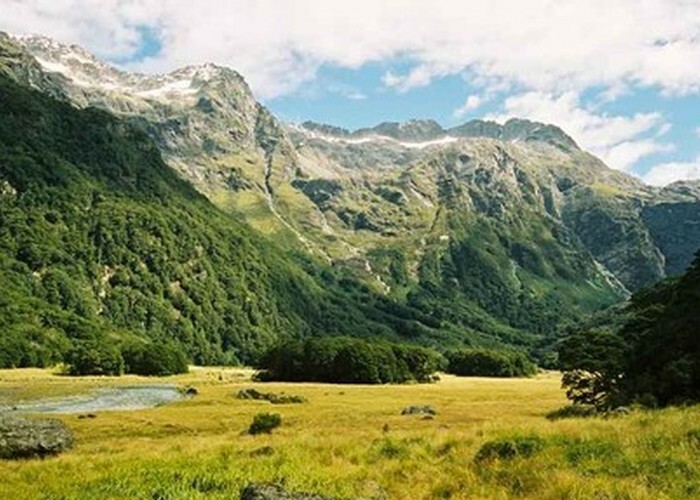 The North Branch of the Routeburn • By pmcke. 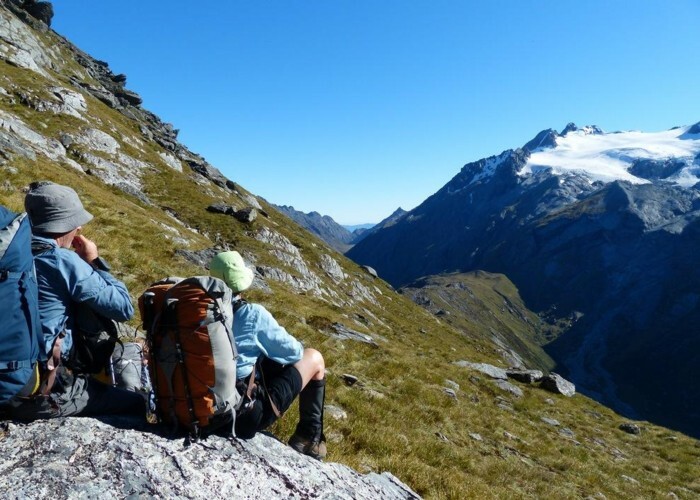 From the col a climb of Mt Nerius to the east is a rewarding side trip for the energetic. Cross through North Col to the North Branch of the Routeburn. The Couloir on the Routeburn side of North Col is usually snow filled so it might be appropriate to have ice axes for this section. Once off the snow head down stream, following your nose and boulder hopping in the stream most of the way down the valley. Sections of track bipass some of the gorgy sections and you will pick up more and more signs of civilisation as you head down stream. There is a track that goes through the last section bush. This can be located by going to the right of a lagoon hard up on the true right of the valley just before you enter the bush. After passing through this bush it is only a matter of crossing the Routeburn Flats to the large DOC hut on the far side. You need to have made a booking before you can stay in this hut. From the hut it is an easy wander down the Routeburn Track to the end of the road where you began. Added 30 December 2007 by pmckepmcke. 7 revisions, most recently 4 October 2010 by pmckepmcke. 1,078 views in the past year (90 per month).